Heat oven to 350°F. Spray bottom and sides of rectangular baking dish, 13x9x2 inches, with cooking spray. Drain thawed bell pepper mixture on several layers of paper towels; set aside. Cook beef in 10-inch skillet over medium-high heat, stirring occasionally, until brown; drain. Stir in tomato sauce and seasoning mix; heat to boiling. Spread 1/2 cup sauce mixture in baking dish. Arrange 4 noodles crosswise, slightly overlapping, on sauce. Spread 1 1/2 cups sauce over noodles, completely covering noodles. Spread pepper mixture evenly over sauce; sprinkle with 1 cup of the cheese. Arrange 4 noodles crosswise, slightly overlapping, on cheese. Spread about 1 1/2 cups sauce over noodles, completely covering noodles. Sprinkle 1 cup of the cheese and the olives over sauce. Arrange 4 noodles crosswise, slightly overlapping, on olives. Spread remaining sauce over noodles, completely covering noodles. Sprinkle with remaining 1 cup cheese. Spray piece of aluminum foil large enough to cover baking dish with cooking spray. Tightly cover baking dish with foil, sprayed side down. Bake about 30 minutes or until hot and bubbly. Let stand 15 minutes before cutting. Serve with guacamole, salsa and sour cream. 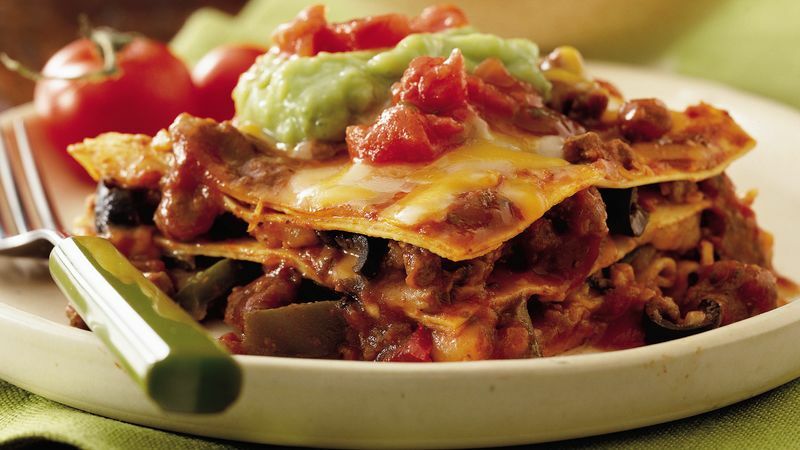 We’re using ground beef in this recipe instead of the usual steak found in fajitas so the lasagna will be easier to cut. When we tested this recipe using slices of steak, we found that cutting the lasagna into serving pieces was difficult. No-boil lasagna noodles are so convenient to have on hand. Most large grocery stores now carry boxes of them right next to the regular lasagna noodles and other pastas.